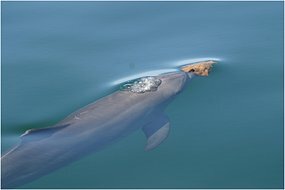 Western Australia: Even our dolphins are hella smart! As noted by Medical News Today, Cosmos, Discover magazine, ABC Science, New Scientist, National Geographic and Georgetown University (among others), West Australian dolphins in Shark Bay are among the only marine mammals in the world known to use tools, and dolphins in Shark Bay that use sponges spent more time using tools than any species except humans. ‘It turns out the brainiacs of the marine world can also be tool-using workaholics, spending more time hunting with tools than any non-human animal.’ — Janet Mann, professor of biology and psychology, who has been studying the Shark Bay dolphin population for more than 21 years. An 18-year-old man has been charged after a report of a vehicle towing a couch in Gooseberry Hill yesterday. East Metropolitan Traffic Police have alleged that the man was driving a Holden Commodore sedan on the Zig Zag Scenic Road around 11.30am towing a sofa with two youths sitting on it. A crowd had gathered to watch, with one person filming the event on a mobile phone. The Kalamunda man has been summonsed for reckless driving. Good to see our police are keeping busy. Every day I see examples and hear anecdotes about this just in my home state of Western Australia. People with the financial resources “queue-jumping” and paying cash to buy themselves out of the “free” public system and those without financial resources being left behind. With some cancer drugs, for instance, costing up to $50,000/year, and high-tech equipment so very expensive for hospitals to purchase and maintain, who in their right mind wouldn’t have seen stories like this coming? There is a looming crisis in WA cancer services because of an alarming shortage of medical specialists and equipment and long waiting lists for treatment such as chemotherapy, a damning independent review has found. A Cancer Council-commissioned audit, prompted by patient complaints and funded partly by the WA Health Department, warns that unless urgent action is taken, the system could collapse within five years as it struggles to cope with an estimated 50,000 new cancer cases on top of the existing load. The report, by University of New South Wales professor of radiation oncology Michael Barton, found that while cancer treatment in WA was usually of a high standard, inadequate facilities and staff shortages were major concerns. It also warned new cancer facilities such as those planned for the Fiona Stanley Hospital would not meet demand. Professor Barton warned WA faced 10,000 new cancer cases a year, rising by three to four per cent a year, but facilities and equipment were unable to cope. Urgently needed equipment included five extra linear accelerators used for radiation therapy. Facilities in public hospitals for chemotherapy patients were overcrowded, with patients often waiting many hours to be seen by a junior doctor for 10 or 15 minutes. Treatment areas at Royal Perth Hospital were “dangerously overcrowded”. Some high-cost cancer treatments were available only to privately insured patients or those willing to pay. And patients living in rural areas were at greatest risk of missing out on vital treatment. Now Western Australia is not some cash-strapped developing nation. We are in the midst of a minerals and energy boom the likes of which Australia has never seen, and our State (with about 2 million people to service) regularly runs budget surpluses of over $2 billion. But in Western Australia you can see what happens when you have the double whammy of an incompetent Leftist (ALP) government and a Socialised Health-Care system. So come on, Americans, think: Does any government, anywhere in the world, do such a stellar job on the things they’re already responsible for that you want them in charge of all of your health-care needs as well? Repeat after me: Socialised/’Universal’ Health-Care is by necessity Rationed Health-Care. And it’s more expensive, in more ways, than you might think. Demonstrating yet again that Western Australia (“Don’t blame us; we voted Liberal”) is chock-full of uncommonly intelligent and perspicacious folks of all ages, the children at St John’s School in Geraldton have submitted the poster below as their contribution to Parliament House’s “20th Anniversary” School Posters competition. In amidst all of the good traditional iconic Australian images, please note the amazingly apt likeness of our new PM, star-sucker Rockstar Rudd. To see more entries in the School Posters Competition, see the Parliament House website here. Time to throw your favourite dog in the back of your favourite ute and head down to Corrigin. This event has created a friendly rivalry between Western Australia and Victoria where the event was first held in 1997 at St Arnaud. The first record set at 214 Dogs in Utes. The record was then broken in May 1998 at Terang, Victoria in an event that was organized by the Southwestern District Apex clubs. This event managed to attract 325 Dogs in Utes. It was at this time that local Corrigin Apex President, Mr Bob Cooper had a brainwave and decided that Corrigin should have a ‘crack at it’. He came back from the National Apex Convention in Victoria and put it to the local Corrigin Apex members, who took on the idea with great enthusiasm. Within three months, and with countless hours of dedication from many groups and volunteers, Corrigin held its first Dog in a Ute Queue event on the 31st October 1998 successfully breaking the World Record by attracting 699 Dogs in Utes from places far and wide. With an estimated total of 3000 people on the day and raising $20,000 for the Royal Flying Doctors Service, Corrigin was rejoicing its fine effort and sent the challenge back to Victoria. Three more unsuccessful Record Breaking attempts in Victoria then followed until 2000 when the Southwestern District Apex Clubs once again took on the challenge in Warnambool, coming out victorious with the new World Record of 797. Fast forward to 13th April 2002 – a day that will be remembered by many, as the day that Corrigin smashed the World Record of Dogs in a Ute with 1527. More than 4000 visitors and locals alike banded together and enjoyed the camaraderie, food, beverages and live entertainment. It was a day where there was not one altercation or complaint despite the huge number of people attending. A day when rural Australia ruled supreme and everything else seemed insignificant. Over $60,000 was raised on the day and has been donated to the RFDS and local Community Emergency Services. Since this day, as far as we know, no other town has been able to break the record. Official Dog in a Ute web site here. See? Western Australia is SO not dull. And, if you can’t make it, think about dropping a few bucks the Royal Flying Doctors‘ way anyway — Here’s the RFDS gift shop. And, find out more about APEX Australia here. Who says Perth is ‘Dullsville’? See, if you were here in Perth today, you could come along and watch this man keep his word! It’s a bet Carey Smith wishes he’d never made, and today he will pay an embarrassing price. The Delta Securities research analyst bet with two stock broking mates at a pub over a few beers back in 2005 that gold prices would not hit $US1000-an-ounce before 2011. On March 14 gold hit that price and the 37-year-old self-confessed single bloke had no other option but to fulfil his end of a potentially embarrassing bet. At 2.30pm today he will pull on an unflattering stretchy green lycra mankini and do a dash down Hay Street in Subiaco. More photos (if you can bear them) via here. If you’d like to get behind Carey “Mankini Man” Smith (figuratively, not literally!) you can leave messages of support here. Think what you like, at least this man keeps his word, so respect for that. Listening, Kevin?